Celeste Mitchell takes a walk through Brisbane’s industrial revolution and stumbles upon urban gold. You can see them hovering and heaving, moving their mechanical arms like Transformers in the sky. I count 17 cranes, dotted between semi-constructed towers that will soon be sleek, luxury apartments. And while, at times, Newstead is a cacophony of construction, down on street level, the up-and-comers have already made themselves at home in anticipation of the boom. Newstead from above, on top of a new Alex Perry-designed hotel. Some 17 hectares of new waterfront parklands, added to the trendy Gasworks Plaza and a new Alex Perry-designed hotel are welcoming a new, upmarket inner-city guard with open arms. Butting up against New Farm and Fortitude Valley, and slicing down to Teneriffe along Commercial Road, the timber yards and wharves of Newstead’s industrial past have made way for yoga studios, cold-pressed juiceries, microbreweries and artisan bakeries. They’ve all sidled in between commercial offices, mechanic workshops and electrical supply stores, giving it a vibe akin to Sydney’s Alexandria. In fact, it was an old World War II aircraft hangar on Stratton Street that attracted the attention of the local rock veteran, and its cavernous domed roof has played host to San Cisco and Spiderbait, local indie acts and Pink Floyd tribute shows during its first year in the ‘hood, acting as stent in Brissie’s aorta of rock venues, flowing towards Fortitude Valley. The beer garden, with its shipping-container bars, is the spot to be for a drink and feed anytime, but especially Sunday afternoons when Triffid Roots presents a line-up of bluesy acoustic tunes, best washed down with jugs of Pimms. From here, you’re in prime position to kick off a craft beer crawl, with Newstead Brewing Co. just two blocks away on Doggett Street. Six house ales are on tap, alongside a menu that covers off pizzas and cheeseburgers through to posh nosh, like duck breast with parsnip purée and pear. Grab a tasting paddle of beers and work your way through a selection of brewskis, while overlooking the brewing vats in this renovated 1940s warehouse. Another two streets away, the guys at Green Beacon Brewing Co. will take any interested parties on a no-frills backlot tour every Monday at 6pm, to get a peek into their process while sipping IPA and pondering beard-stroking topics, such as the merits of fresh hops versus dried. IPA zone: Green Beacon Brewing Co, Newstead. A line-up of food trucks, offering everything from pizza to bone broth, also rolls in each night to keep punters satiated. If you’re looking for a more sit-down affair, wander down Helen Street and along Skyring Terrace to take your pick from the restaurants of Gasworks Plaza. Opened in 2013, the complex has gourmet food markets and takeaway joints alongside a barber, homeware and gift shops, plus Lorna Jane’s first Active Living Room, which serves up HIIT and pilates classes alongside acai bowls and activewear. Head to Hatch & Co. for dinner with atmosphere any night of the week – the lamb shoulder is what carnivorous dreams are made of. Alternatively, a walk under the tall iron Gasometer – a remnant of the 1887 Newstead Gasworks – will put you at the doors of the newest culinary offering, The Defiant Duck. Here, the onus is on finger-licking, smoky meats and buffalo wings enjoyed over cold beer and hearty conversation. Order the mac-and-cheese croquettes and thank us later. Perhaps the best way to get an understanding of how much this neighbourhood has changed is to walk to heritage-listed Newstead Park, where Brisbane’s oldest remaining residence overlooks the river. Built in 1846, Newstead House is now mostly used as an events space but, every Friday to Sunday, you can tour the museum and learn about the significance of Newstead in Brisbane’s early pioneering days. Nearby, you’ll find The Golden Pig Cooking School and Cafe tucked into the outer fringes. Try a Chinese roast duck toastie at The Golden Pig Cooking School and Cafe. This bright and plant-filled warehouse kitchen runs regular classes under the tutelage of owner Katrina Ryan (ex Rockpool and Spirit House) and guest teachers, but if you’re visiting on a weekday, pop in for a coffee and house-made muesli with poached pear and rhubarb, or Chinese roast duck toastie, and thumb through their collection of cookbooks for inspiration. If you’re feeling last night’s brewery binge, head to the health hub at the Teneriffe end of Commercial Road (you’ll know you’re there when you spot all the pilates, boxing and crossfit studios). Make like a local – don your lycra and grab a fresh juice from Press’d, or brunch with the cool kids at Sourced Grocer. This compact cafe and grocer was one of Newstead’s earliest hipster residents, with sustainable, local produce (like fresh honeycomb from Bee One Third, and boutique BNE Soda Co. syrups) lining their shelves and permeating their menu. The coffee is excellent, and perching on a milk crate to watch the world go by is a perfectly legitimate way to while away a morning. When you’re ready to eat again, head toward the river and you’ll find Wilde Kitchen where everything on the menu is gluten free, fresh, clean and lean. Grab a superfood-loaded salad, tuck into turkey mince san choi bow, or sip on a nourishing bone broth. Not in a paleo mood? Follow the river walk until you reach Malt Pier, where a two-course prix fixe lunch special will set you in good stead for the rest of your exploration. Order the house-smoked salmon, and then discover an entirely new level of crispy skin if the barramundi is on as fish of the day. Skip dessert and instead head to Nodo, the ridiculously Instagrammable donut shop that opened in November 2015 on the corner of Ella and Chester Streets. The space is a harmony of concrete, rose gold and crisp white, complemented by cascading vines and the smell of freshly roasted coffee. Bite into one of their artful, gluten-free baked creations, smothered in couverture chocolate, and topped with gingerbread crumbs or freeze-dried raspberries. After you’ve ‘grammed it, of course. 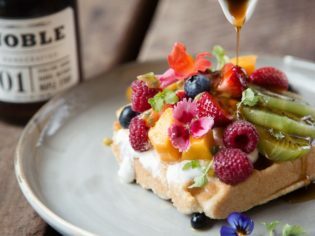 If you think anyone who quits sugar is mad, Chester Street Bakery & Bar will send you into a stupor with loaded milkshakes – we’re talking Tim Tams, ice-cream and doughnuts – as well as Nutella lasagne, ice-cream sandwiches and pretzel-studded choc tops as just some of the Willy Wonka-esque creations on offer. When you’re ready for whisky over Whiz Fizz, duck around the back of a nondescript office building to find The Twig & Berry, where you can BYO food (yes, really), settle into badger-print armchairs, and play giant Jenga over 1920s-style cocktails, because a little bit of old school is always nice in a world filled with brand new.